Books, wine, home brews, gardens—these days, there is a club for every interest. But perhaps none is quite as tasty as Tupelo Honey Café’s Pimento Cheese Club. The chunky spread made with sharp cheddar, mayonnaise, and pickled red peppers already has a loyal following, but Executive Chef Brian Sonoskus’ adaptation takes it to another level. The Asheville chef elevates the Southern staple with jalapeños, Gruyere, herbs, roasted garlic, and other flavor twists. Tubs of the gourmet pimento cheese and complementary goodies arrive in six, bimonthly installments. 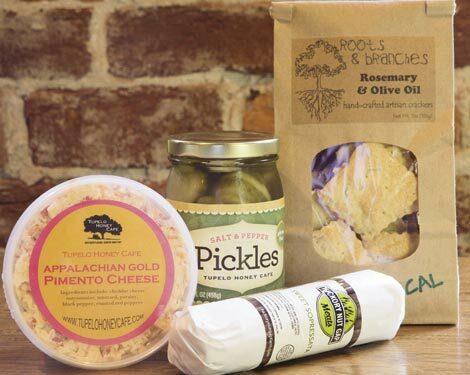 Seasoned crackers from Asheville-based Roots & Branches, such as olive oil and rosemary, as well as Hickory Nut Gap Farm-raised meats—smoked kielbasa, spicy or sweet sopressata, salami, and pepperoni charcuterie—fill out the package. You can also add the café’s brand of salt and pepper pickles to your order. “Chef Brian’s pimento cheese is one of the most popular items on the menu,” notes club cocreator Elizabeth Sims. He serves it warm with tortilla chips. With the new club, how you serve the tasty spread is up to you.